Derek Kinzett was born in Gloucestershire in 1966 and moved to Wiltshire eleven years later, taking his Degree course in Art and Design at the local college in 1984. 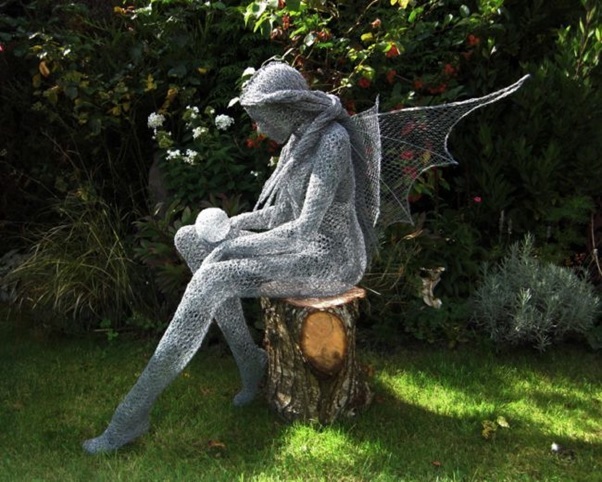 His work in wire mesh has really caught the imagination of the public and he launched “The Inner Spirit Collection” of handmade life size wire sculptures in 2007. His unique creations proved so popular that he now has works in private collections in the UK, America, Russia and France. 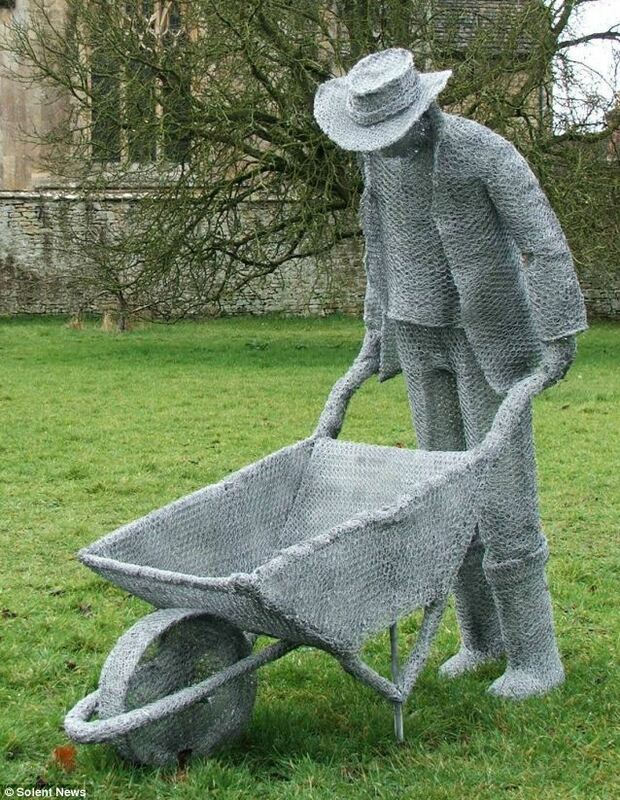 His sculptures include figures of a cyclist, gardener and several fairies, all created entirely from galvanized wire. Derek estimates that he spends at least one hundred hours per model but the items sell for around £6,000 each. A typical sculpture requires Derek to twist and cut approximately 160ft of wire to create the fine detail that makes his models so stunning. Each stands at around 6ft tall and take a month to complete, with hours dedicated to perfecting the eyes, hair and lips. Derek admits that his hands suffer badly from the hours he spends twisting and cutting the wire but cannot get the same feel for his work when wearing protective gloves. Having attempted to work in gloves, he quickly discovered that they were impeding his work and he would rather suffer the consequences. The commissioned pieces are personally installed by Derek in homes and gardens across the country. 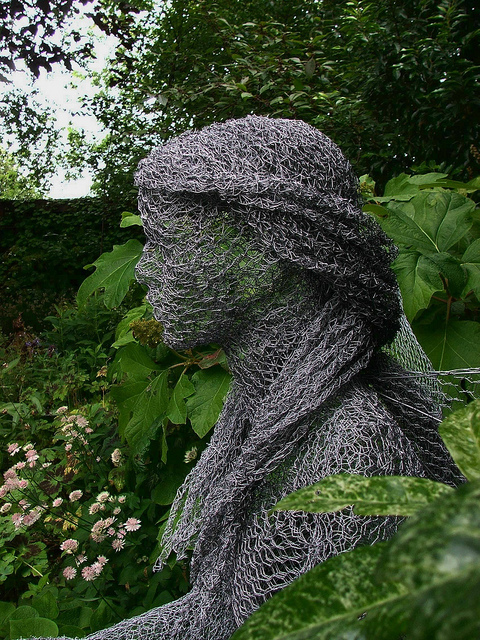 It is the ghostly see-through nature of the sculptures that demands people’s attention. Derek begins by making sketches of the images that he seeks to create. If necessary, he uses his computer to convert the original images into line drawings so that he can get a good 3-dimensional feel for the figure. These are then used as a guide for him to cut a mould from blocks of expanding foam using a carving knife. Once he is happy with the mould, he wraps the wire painstakingly around it, sometimes up to five times in order to add strength to the sculpture. The mould is then removed to reveal the dramatic see-through sculpture. Derek enjoys the fact that people often do a double-take when passing his sculptures. He believes it is the natural curiosity to discover how they are made that attracts so much interest. 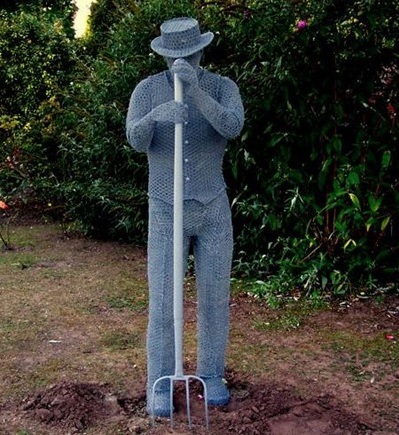 Once completed, the sculptures are sprayed with zinc to prevent them from rusting and an acrylic aluminium coating is added to restore the original grey colour of the wire. Private Commission, Nottingham. UK. 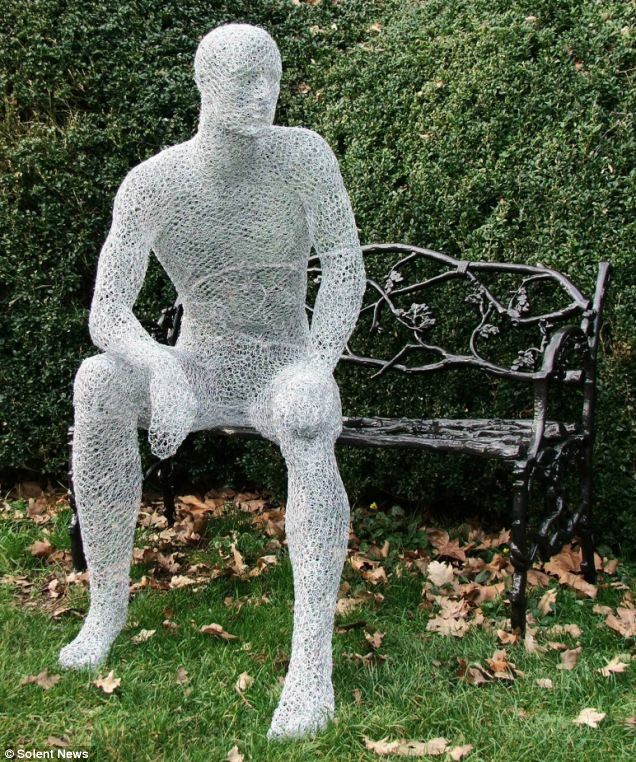 Life size wire sculpture. Titania, from A Midsummer Nights Dream. Delivered and installed 17th June 2011. 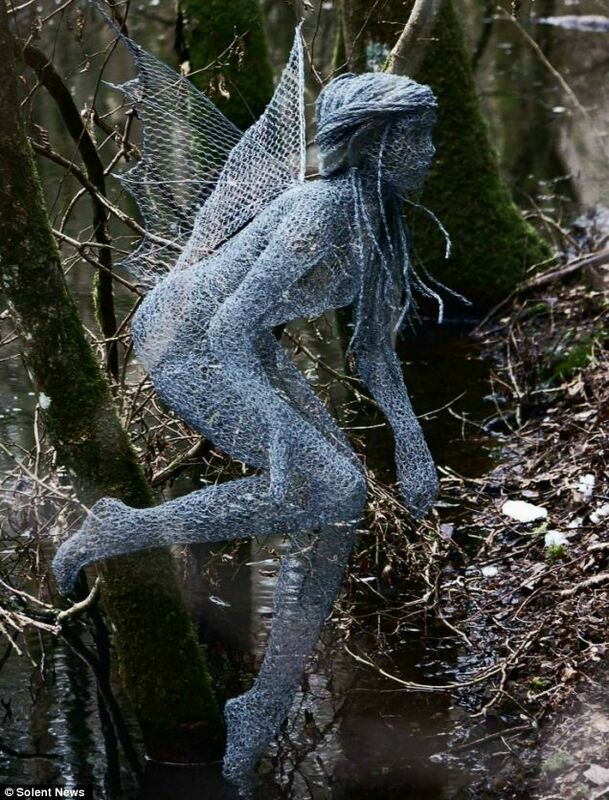 This entry was posted in Recycled, Sculptures, Wire and tagged Chicken wire, Derek Kinzett, sculptor, sculpture, wire sculpture. Bookmark the permalink.